Today’s design inspiration is Allison from @theclevergoose! Her home is newly renovated which means that every inch of her home was thought of and boy can you tell! With Allison, it’s all about details (maybe because she has a whole shop full of incredible farmhouse finds!). Design Inspirations has easily become one of my favorite posts to write because I love taking a deeper look at some of my “friends” (and people I want to get to know) on Instagram! I notice that I consistently really like certain people’s photos but I don’t often take a ton of time to look intensely at a person’s feed. But Design Inspirations lets me dive deeper and really take the time to look at and love so many images that I know we obsess about! With that said, today’s post is all about heather of @Heatherbuglane! Perhaps I fell in love with her account because her dog looks so much like Sport- ha! But besides that, her home is so bright, fresh and white! Oh yeah, and symmetrical! Symmetry is so often overlooked these days so I love when Heather’s home pops up in my feed as it always seems to be in balance! I mean… how gorgeous is her living room? It’s simple. It’s cozy. It’s all white everything! I particularly love her chandelier. 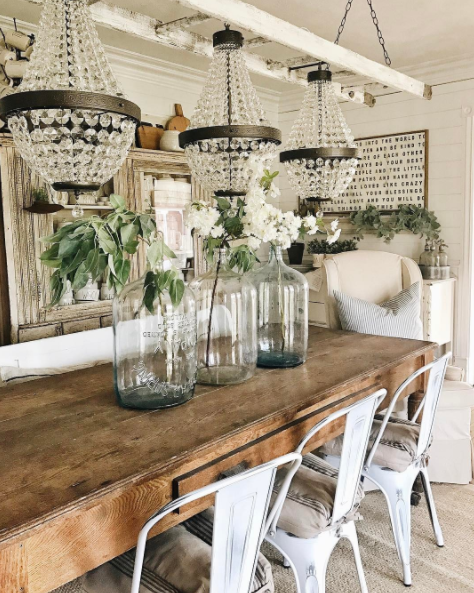 I feel like this isn’t something that dominates my feed too much and the fact that she has incorporated a less traditional farmhouse item into her home really excites me! 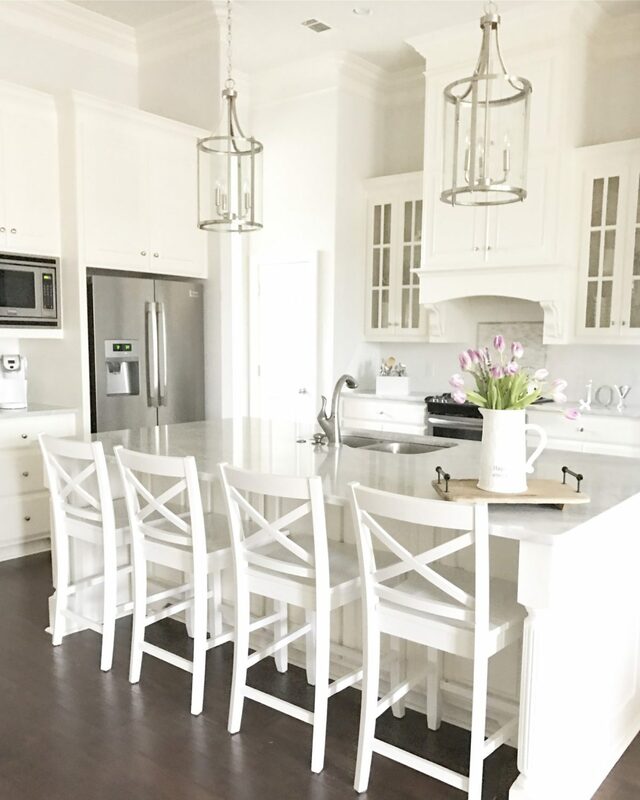 My home is similar in the aspect that we renovated so long before farmhouse style was a thing and my style before was on the traditional side. I too am finding a balance between my old style and new. Anywho… back to Heather! Heather was sweet enough to answer a few questions for us to give us a better glimpse into why she started on Instagram, what her favorite aspect of IG is and of course, what her unicorn Rae Dunn piece is! Thanks, Heather! Leslie Saeta: What made you decide to go on IG and share your farmhouse with others? Heather Lane: I started my IG as a decor/fashion/product IG because I didn’t want to flood my personal IG with my latest shoes, purses, or decor and wanted to organize my accounts. I have 3 IG’s! LOL! 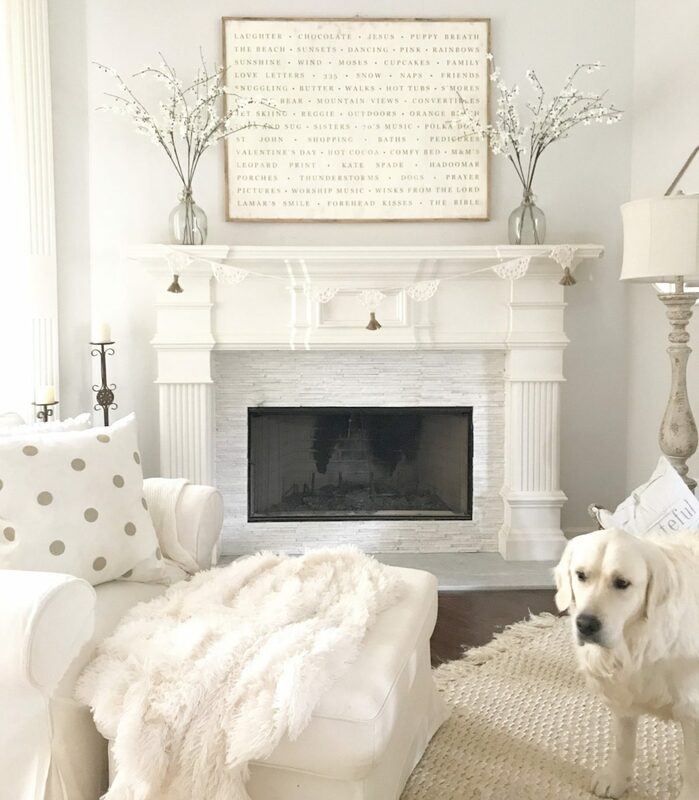 A personal one, a decor one, and a dog one (of course)! The decor/fashion/product IG obviously turned into a decor only account. LS: What was the single best thing you did to gain meaningful followers? HL: I actually was pretty clueless about the IG decor community and didn’t know much about gaining followers but I got them because I had two close friends who wanted me to be a part of their Arkansas hashtag #designdiamonds. I was all in but had NO idea what I was doing! When I got in that hashtag, I hadn’t even posted on my decor account in 5 weeks. Once I started that hashtag, I started learning about the whole IG community and was hooked. I have ALWAYS had a passion for decorating and this was right up my alley! After that I got asked to do two other hashtags #wordsindecor and #decorate4theseason (which is on a summer break) and gained followers. I was contacted by one sign maker who asked me to do a giveaway and I gained followers that way. I also have noticed that I have added followers when big accounts have featured one of my pictures. It’s been a slow and gradual gain for me but I have loved it! LS: What’s been your favorite DIY project that you’ve featured? HL: I’ve got several DIY on my IG…mostly painted furniture but definitely the most meaningful one is the recipes I framed of my late grandmothers that are hanging in my dining room. LS: What’s your favorite farmhouse decor item? 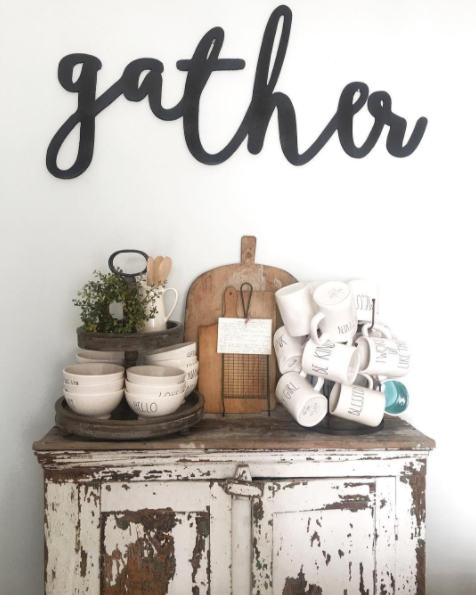 HL: My favorite farmhouse decor items are all my handmade signs that my best friend Hope made for me. I have one that is just words of all my favorite things! I love that piece! LS: What’s been the most rewarding part of being on IG? HL: Definitely the most rewarding thing about being on IG is the friends I’ve made! I am so thankful for all the wonderful people I’ve met. Such a blessing!! LS: My Rae Dunn unicorn….? HL: My Rae Dunn unicorn piece (HAHA! I love this one) is my sugar and creamer set that is red inside. That set is so much fun for Christmas and Valentine’s Day!! Make sure you’re following Heather on Instagram @heatherbuglane and make sure to give her some love! For this week’s installment of Design Inspirations, I wanted to introduce you to Michele of Sweet Threads Co! Her home combines the tenants of farmhouse and simplicity to create one beautiful, open and airy space that I’m totally swooning over and you will too! 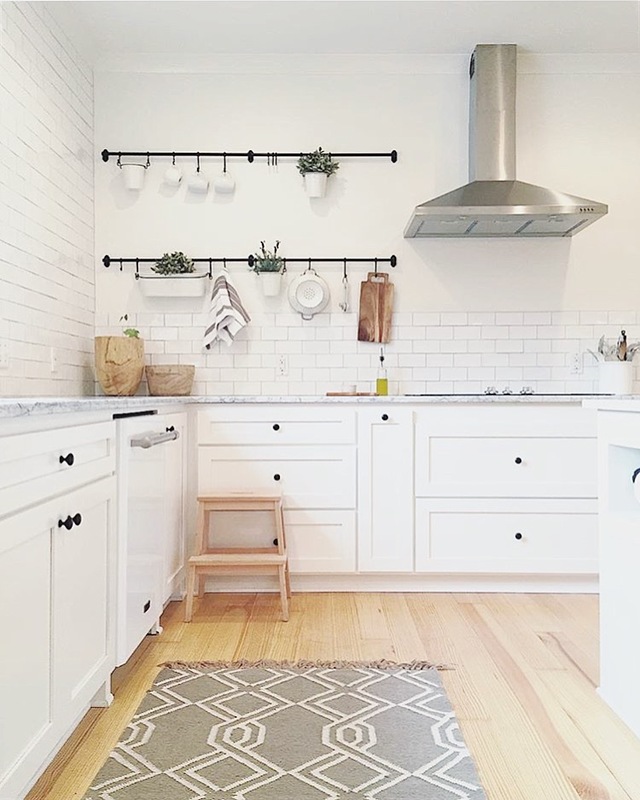 Today’s Design Inspirations is all about Chelsea of The Simple Abode. Her forever home (as she calls it) is truly the essence of the #simplefarmhousetouches hashie! Today’s design inspiration is all about Liz Marie Galvan. If I ever had to claim an Instagram “hero” it would be her without a doubt. Why? 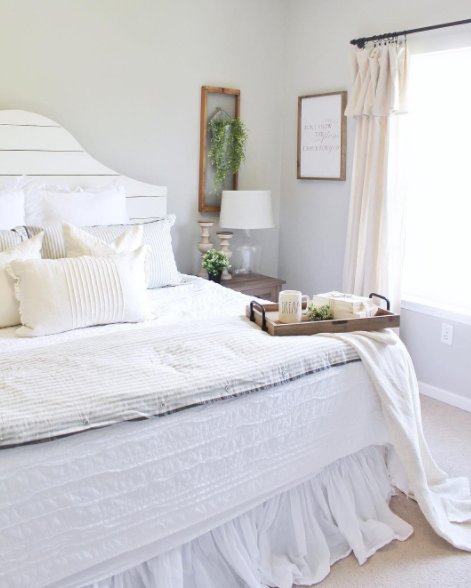 To start, her photos are GORGEOUS and her home is right out of an episode of Fixer Upper. But more than that, she has 208K followers and takes the time to respond to what looks like every. single. comment.